Acupuncture works against pain – the result of three large meta-analyses. The only sure thing though: The needle has to be “on the spot” but it is not quite sure where this spot is. Because fake acupuncture is helping to let pain vanish as well. It seems that we finally have proof and evidence: Acupuncture relieves tension headache, migraine, back ache and also post operative pain and it also braves the treatment with analgesics. What’s like grist to the mills of alternative physicians brings also opponents into the arena. 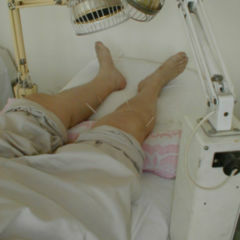 The reason: Not just pricking in accordance with traditional Chinese medicine works but also fake acupuncture. Two meta-analyses regarding migraine and tension headache of the Cochrane Collaboration with a total of more than 6,700 patients prove that acupuncture cuts the number of attacks of migraine patients by half. The number of head ache days sank and also the intensity of the pain decreased after eight weeks. A long-term study documented an effect still after nine months. Results for patients with tension headache were similar. In addition the needles plus drugs were superior to a sole drug therapy. Not at all or hardly noticeable though is obviously whether or not the acupuncture was real – either on the wrong spots or not deep enough. The head of studies Professor Klaus Linde at the Center for Complimentary Medicine Research of the Technical University Munich knows neither the reasons for the positive effect of acupuncture nor for the fake treatments. But he does have a possible explanation at hand: Acupuncture itself might have a particularly high placebo effect. Also possible might be an activation of certain nerve fibers as well as a falsification of results by participants of non-blinded studies discontinuing the therapy after they found out that they did not get acupuncture. Linde does not have any doubts about the therapeutic effect of acupuncture – contrary to his colleague Asbjørn Hróbjartsson at the Nordic Cochrane Centre in Copenhagen. He surveyed the effect of acupuncture during a meta-analysis with more than 3,000 patients suffering from migraine, lumbalgia, gonarthrosis and post-operative pain (BMJ 2009; 338:a3115). The marginal difference between real acupuncture and fake acupuncture documented in the statements about pain in the visual analogue scale was not relevant statistically. His conclusion: The analgetic effect of acupuncture is better than the one with no treatment but it does not matter whether the patient was acupunctured correctly or just pricked anywhere. Also Hróbjartsson criticizes the lack of blinding of studies which might be responsible for the falsifications. In addition, psychological effects of the pricking – no matter where it’s done – should be taken into consideration in the future as well. With all appreciation to the critics – but do we have to doubt all basic principles of acupuncture now due to those results? Could we by any chance just ask our partner or neighbour for the favour? Theory and effect of acupuncture are complex issues. In consideration of the proven effect and the little side effects compared to analgesics, for sure not only some physicians, but also many pain patients wish the treatment was reimbursable. Whether patients are as interested in exact mechanism of action as professionals remains doubtful. After all only a few patients really know just how and why pain killers help.